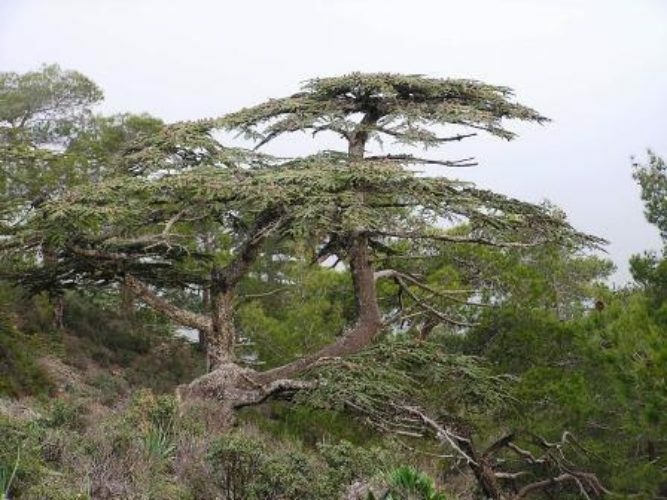 Cedrus brevifolia, first described 1908 by Henry John Elwes (1846 – 1922) and Augustine Henry (1857–1930), is commonly known as Cypriot cedar. A commonly seen synomym is Cedrus libani var. brevifolia. Description. Cypriot cedar is a medium-growing, evergreen coniferous tree. Crowns on older specimens are broad and umbrella-shaped. Branches are short and horizontally spread. Needles are 0.2 to 0.35 inch (5 - 8 mm) long, thick and Blue-green in color. Seed cones are cylindrical, with a large protuberance in the concave apex, about 2.8 inches (7 cm) long and 1.6 inches (4 cm) wide. Distribution. This species is native to Cyprus — the mountainous area of Pophos, Troodes and Tripylos, where it covers about 500 hectares. Attribution from: Vidakovic, Mirko. ©1991. Conifers: morphology and variation. Translated from Croatian by Maja Soljan. Croatia: Graficki Zavod Hrvatske. Cedrus brevifolia — mature trees growing in habitat.